The rain stopped and the clouds started to part just in time for a wonderful event benefiting a great cause. The cars were showing up loaded with people who were ready to get their instructions and hit the road looking for clues. What were we doing? We were participating in a road rally. Not just any rally, but the Second Chances Garage 3rd Annual Road Rally. This was my first rally; I wasn’t sure what to expect but I knew it was for a good cause. Dynamic Automotive is a Second Chances Garage Partnering Garage and the premier sponsor for the event. We not only wanted to support the event with sponsorship but we wanted to participate to help raise awareness and to have a little fun. When Dynamic decided to participate we didn’t do it with one car, no we brought 4 cars, one for each location. Nothing like a little competition to keep things interesting! So what is a road rally? That’s exactly what we were asking when we showed up April 1st at the New Market Grange Hall. None of us knew what was in store, but all of us figured it would be a good time and man was it ever. Rick Trawick, founder of Second Chances Garage, got us organized and kept the mood light as he went over the instructions which were pretty simple. First this wasn’t a race of speed, but of wit; we had 2 and half hours to get all the answers we could. We were to follow the map and along the way use the clues to answer the questions. If we miss something we were not supposed to return because we would not have enough time. He ended with well wishes on our hunt and safe driving. He put his cell phone number on the instructions just in case anyone got lost. He laughed and said to just follow the directions and you can’t get lost. If someone does call he will be sure to get a laugh out of it. Everyone chuckled and pretty much decided to follow the directions so we wouldn’t get to humor Rick at our own expense. Rick also advised that there may or may not be some trick questions, or even some answers may not exist. This definitely added to our confusion. Hey it was April Fools Day! Originally I had guessed there would be maybe a dozen stops. I was wrong, once we opened the book we realized there were clues everywhere and we would need to really pay attention. We were lucky having a team of 3 from the Urbana location. Paul Foster, Rebekah Pavlovsky and myself teamed up to make sure we were the best finishing Dynamic team. At first we didn’t do so well. We got one but soon realized we had missed 3 in no time flat. Did you know that Cecil Pond began making garden tractors in 1946? We know this question had to be about Lawson’s Power Equipment in New Market but we got it wrong. We chose Toro when Wheel Horse was the correct answer. Our travels took us out of New Market onto Boyers Mill Rd. One question asks when was Fairview Chapel started? It was etched in a stone on the church, 1847. We got that one right. We were already 10 questions in when we made a right onto Gas House Pike. We were getting the hang of it now and were doing much better. Passing by Westwinds we got our clue for “Only nine Left” which was on a realtor sign at West Winds. A tricky question on Drummine Rd asked “When was George Duvall born?” There was no sign or building but a tomb stone across the road when we came to a stop sign. Rebekah caught it right away. Now we were on a roll. We headed north on Green Valley Rd, across Artie Kemp road finally going through Libertytown. We got the answers to “Freedom School?” and “Not 6 Siblings Gallary”. They were Liberty Elementary and 7 Sisters Gallery. Up New Windsor Rd to Coppermine road where we noted many farms and yard art. We went along many scenic county roads like Pine Tree, Bennie Duncan, Daysville, Stauffer, and Crum to Rt 26 where we found the birds nest at the Orioles Club. From this point we took the back way starting with Dance Hall road to get to Urbana. The Urbana Volunteer Fire Company was founded in 1973, proudly displayed on their monument sign out front. Our only stop was the Dynamic Automotive location in Urbana. We had to ask the Car Wash attendant what year Dynamic was founded? The answer is 1995 and everyone participating in the event received a free Tsunami Car Wash coupon. We were getting close to the finish now heading back to New Market and we found the home of the headless horseman on Mussetter Rd at Sleepy Hollow. Turning back onto Old National Pike, our New Market location had a clue, the name of the Mural, “America’s Historic Crossroads”. The final two questions that we answered were about Dynamic Automotive. How many shops did we pass on the route? The answer was 3, we passed one in New Market, Urbana and Libertytown. The last question wanted to know how many times Rick said Dynamic in his opening briefing. We guessed 6 and got it right! Sometimes you just get lucky! Rick also included a list of tie breaking questions about cars that we tried to answer. In all we drove 50.1 miles and tried to answer 96 road rally questions and 14 car questions from Rick. We returned to the Grange Hall, turned in our rally book and had a nice lunch catered by DJ’s out of Buckeystown. After everyone returned and finished eating the board members were announced. Special recognition was given to Maude Franceschina for all her hard work to get the event organized. The event sponsors were thanked and mentioned. Without them none of this would have been possible. They are Dynamic Automotive, NuWave Solutions, Byk Gardner, FCB/ Frederick County Bank, University Auto, Morgan Keller, Plamondon Company, and the New Market Grange Hall. The Department of Labor Secretary, Kelly Schulz spoke about the good deeds Second Chances Garage does for the community and how it’s important for people to help each other out. She compared Second Chances to Vehicles for Change, a similar organization that also helps to train people that are reentering the work force. She expressed her appreciation, and that of the governor’s, for everything that was being done to make Maryland better. I must say I am happy we decided to support and participate in Second Chances Garage 3rd Annual Road Rally. The work they do, of fering affordable transportation and a means to maintain it is a great way to offer a hand up to people trying to make positive changes in their lives. I encourage people to donate and if they have a car they do not need to please donate it. Its tax deductible and helps people in our own community. Second Chances is helping people that are helping themselves. They are not just offering a hand out but a hand up. Together we can help everyone in our community live better lives! 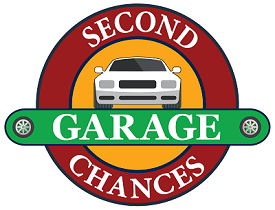 With a passion for cars and helping those in need, Second Chances Garage seeks to make a difference in Frederick and nearby communities by providing “second chances” for individuals and families in need of safe, reliable transportation. Since 2010, generous folks such as yourself have donated vehicles in any condition. Those that meet specific criteria are refurbished and placed with well-qualified individuals referred via our Partner Agencies. Pick up can be arranged from your location in our service area. Each car is thoroughly examined and all necessary repairs completed. Vehicles are Maryland State inspected and carefully cleaned and detailed so recipients can take pride in the car they receive. Dynamic Automotive is an Industry Leader in automotive repair. Dynamic Automotive has been serving Frederick County residents since 1995 and has established a coveted reputation as an honest, responsive and competitive automotive repair company. At Dynamic Automotive we use the utmost in State of the Art Technology and Advanced Level Technicians to service your domestic and import vehicles. If someone were to ask us what makes Dynamic Automotive different then every other shop, that’s simple, education! We are big believers in educating ourselves, our team, our customers and the community as a whole. We began this business by not only learning how to work on cars, we wanted to learn how to operate a shop that was respected and able to be relied upon. Dynamic Automotive is big on giving back to the community, by supporting our local schools, fire departments and other local nonprofit organizations. Community based shops are special because they give you the opportunity to become close with your customers. This closeness is what inspired our brand, Where Customers Become Friends! Here, at Dynamic Automotive, we strive to make our customer’s visit a pleasant one, with friendly customer service that exceeds your expectations. We believe in helping our customers make informed and educated decisions regarding their vehicle’s maintenance and repairs. Customer satisfaction is so important to us that we call you back after your repair to make sure you were happy with the service you received!